“The Illustrated Art of Manliness” is a guide dedicated to the lost art of being a man. It illustrates more than 100 practical skills the modern man needs to know. 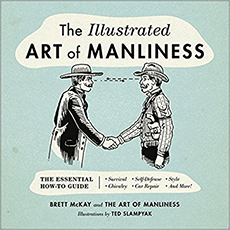 Founder of The Art of Manliness Brett McKay and bestselling illustrator Ted Slampyak aim to help men be the best they can in many aspects of life. Introduction: What Makes a Man?